Pope Paul VI arrives for 1965 Mass at Yankee Stadium. When Pope Benedict XVI celebrates Mass at Yankee Stadium on Sunday, it will be the third papal Mass in the venerable baseball cathedral, a record for any single venue in the United States. On October 4, 1965, Pope Paul VI said Mass in front of more than 90,000 people at Yankee Stadium. 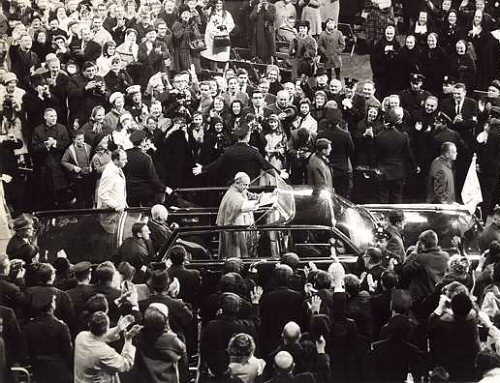 Fourteen years later, on October 2, 1979, Pope John Paul II delivered Mass in the Bronx. Plaques honoring each occasion are located in the Stadium’s Monument Park. Known mostly for baseball, Yankee Stadium has hosted many other famous sporting events, including Notre Dame-Army football, the New York football Giants, one Gotham Bowl, and boxing matches featuring Joe Louis, Sugar Ray Robinson and Muhammad Ali. The Isley Brothers, U2, Billy Joel and Pink Floyd are on the short list of performers who played Yankee Stadium. A Jehovah’s Witness Convention attracted 123,707 people in 1950. The Stadium also hosted “A Prayer for America” in September of 2001 to honor the victims and heroes of the 9/11 terrorist attacks.